Since our last relocation effort, I have neglected finding a new dentist for my family. We had insurance issues…and distance issues…and personality issues. We visited one for a dental emergency that wasn’t the best fit. We visited another for a cleaning and an attempt to do some work, which also wasn’t the best fit. Finally, we found a good fit yesterday. And my child (who had experienced a traumatic dental experience) practically skipped home (figuratively, of course, since we drove), and I have been relieved that all went well. Third dentist worked!!!!! Hooray!!!!! So, a song from my days of listening to and loving Schoolhouse Rock is playing in my head right now; I guess three really is a magic number. Do you agree? What experiences do you have when the third experience worked for you? Happy Cyber Monday to you! and, of course, who can forget Amazon and VS for holiday shopping? Both have some amazing deals going…especially if someone on your list is looking for a Kindle Fire or needs a new bra (or two). Posted on November 26, 2012 Categories Memes, MusingsTags Amazon, clothing, Cyber Monday, handmade jewelry, holiday shopping, Lisa Leonard, Meme, online shopping, Ruche, sales, shopping, style, Vera Bradley, vera bradley handbags, Victoria's Secret, washable fabrics, yodaLeave a comment on Cyber Monday! 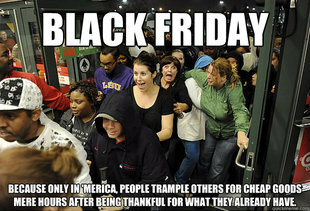 Do I even need to tell you how I feel about Black Friday? However you may be celebrating Black Friday, though, I wish you health, happiness, and debt-free holidays! Happy Black Friday (which has become a holiday in its own way, or so today would seem…)! I bought boots. Well, I actually ordered them. Online. And I looked at all the photos. And I read all the reviews (which were incredibly positive). And, like a nesting mother waiting for her expectant arrival, I cleaned the house. From top to bottom (except the kiddos’ rooms). Like, I even vacuumed the stairs. And mopped. And wiped walls. And guess what was on my doorstep? A beautiful box from Amazon! Hooray!!!! With sweet anticipation, I sliced the tape and removed the gorgeous large box from its outer wrapping…. Wait, I need to back up a little. I grew up in a warm climate. A very warm climate. And humid. Very humid. A few years ago, I relocated to another place (which, for all intents and purposes could have been virtually anywhere) which had seasons…you know, those things we learned about in school…and that James Taylor song? Winter, Spring, Summer, & Fall? Well, I could handle the Spring-Summer-Fall part…but this Winter thing was a bit unconventional…layers of clothes, and coats, and snow clothes for kiddos, and boots…really, boots? Isn’t that what people wear on ranches? I didn’t have nearly that luck with brown boots. If you’ve seen my photos, you can see my brown hair, and I happen to wear quite a bit of brown because of it. Well, I have been on the hunt for amazing brown boots since I found my favorite black boots…& they have eluded me. 😦 I still look in stores, thrift stores, and even have resorted to shoe shopping online (this was my first experience) in hopes to find that brown boot that suits my fancy. And I love shoes. Take a peek at this photo…I didn’t even wear these shoes for the shoot, but I LOVED them and wanted a pic with the shoes!